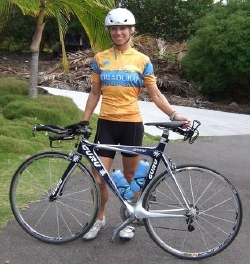 Guru, the world's premier manufacturer of custom-made road and triathlon bikes, is thrilled to announce the second place finish of elite athlete Desiree Ficker at the 2006 Ford Ironman World Championship in Kona, Hawaii, this past Saturday. Ficker turned in an impressive 2nd place finish amongst 1700 triathletes and became the top North American female triathlete at Kona. The 29 year-old Austin, Texas resident, completed Ironman with a time of 09:24:02. Ficker, who performed strongly and consistently throughout the race, transitioned from the swim portion in 27th place. However, she attributes much of her success to the bike leg of the race and her custom Guru Crono, as she was able to pull ahead to 4th place, positioning herself for a superb run in the final leg and her podium finish. "I am so happy with my second place finish in the Ironman Hawaii. The new Guru Crono I was riding felt amazing. I was able to work my way through the field and come off the bike far enough ahead to run into second place. My bike fit was so perfect and comfortable I was having a blast moving through the lava fields on my fast aerodynamic machine, the Guru. The beautiful paint job added a special touch so that I could feel pretty even in the midst of sweat and tough conditions. Thank you Guru!" Guru Executive Vice-President Frank Ianni celebrated Ficker's accomplishment. "Desiree's remarkable performance was inspiring," says Ianni. "Her ability to come off the swim and significantly close the gap while riding her custom Guru Crono, our flagship Triathlon Carbon bike, is a testament to Desiree's training and work ethic." During this year's Ironman, Guru also continued their remarkable progress in the custom triathlon bike market. Not only did Ficker finish in one of the top positions on her Guru bike, but 38 triathletes also rode Guru bicycles during the bike segment of the competition. "Guru had over a 50% increase in our bike count versus last year's Ironman Championship," commented Ianni. "This, combined with Desiree's podium finish in Hawaii, continues to position Guru as the leading force in the custom triathlon bike market." Guru, the premier triathlon and road custom bike manufacturer in the world, handcrafts each bike one at a time and is unique in producing geometrically personalized bicycles in four materials: carbon, titanium, aluminium and steel. The Guru Crono, the most advanced triathlon and time-trial bike of its kind, is the first and only customizable seamless aero carbon monocoque frame in the world. Guru's high-end bikes are designed to meet the demanding needs of serious and passionate cyclists looking for the best. For more information on Crono's features and other Guru Bicycle products please visit www.gurubikes.com. Founded in 1998 and based in Montreal, Canada, Guru is a premier custom road and triathlon bike manufacturer providing retailers and consumers with personalized and completely assembled bicycles, handcrafted in-house with carbon fibre, titanium, steel and aluminium. For information on dealers, please visit www.gurubikes.com and click on Dealers.